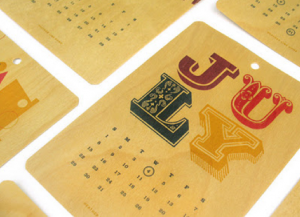 Here are three of my favorite typographic calendars available this year. It’s amazing what type designers are doing in the way of font choices and materials. I admit that 99% of my “calendaring” is done via computer, but these three pieces almost elevate the calendar to the level of art. This one is $32 and is printed on 12 different wooden cards. Each screen-printed with colorful inks and starkly different fonts. This one has been around for over a decade (it’s been known as Pentagram’s calendar) and the designers are branching out with this one. 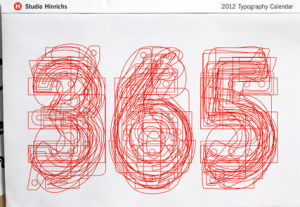 The 2012 edition is comprised of original fonts that are not for sale anywhere. The fonts were designed by contemporary designers who used landmarks, technology and pop culture as inspiration. This is sold in two sizes for $35 and $55. This one is by far my favorite. Geisler successfully ran a Kickstarter campaign to push his calendar into production. 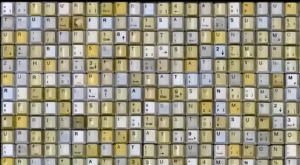 His calendar is massive as he used 2012 computer keys to list out every day of the year. No doubt this one would be one heck of a conversation piece. It’s pretty fun. There are various prices. A single calendar runs for $35 (including shipping). Prices go up if you want signed copies or the actual keyboard keys. It’s worth watching the video just to get an idea of the artist and how the calendar is laid out. This is going on my list for the holidays. It makes me laugh every time I look at it. It’s a perfect statement for the bookish and the designer alike. 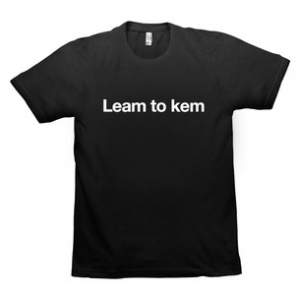 It’s available from the Abel Parris web-shop. 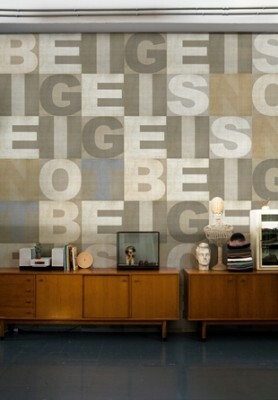 Here’s the site where you can check out all the wall coverings. Just click on the ‘Life’ drop down. There is also a drop down to select the language. Setting it to English is helpful. It’s doubtful that we’ll get any of these exact typographic wallpaper designs, but I certainly have some cool ideas now. These are two of my favorites this year… and they’re cheap! First up is one sporting a series of wood cards printed in such a manner that they resemble old type-specimen cards. Pretty cool. It’s only $24 for the whole 2011 series. But this one has to be my favorite so far. It’s almost a work of art. 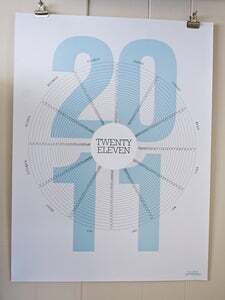 This wall calendar is only $10 and displays the entire year on the front, thanks to the cool circular type design. Sure this isn’t one that you could log appointments on, but it sure would look nice on the wall. Did I miss any other cool calendars this year?